In Deployment Manager, you can run Pega unit tests, which you use to validate your application functionality, on the candidate systems in your pipeline, such as quality assurance. By running Pega unit tests, you can ensure that you quickly deploy higher quality software to production. 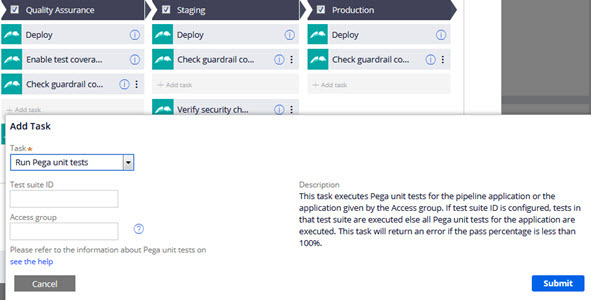 In addition to running Pega unit tests for the pipeline application, you can now run Pega unit tests for another application by specifying an access group.You can also run Pega unit test suites so that you do not need to run all the Pega unit tests in your application. For example, Pega unit ad-hoc test suites can informally test a feature, and smoke test suites can verify that critical application functionality is working as expected. By using a test suite, you can quickly test your application by running only the Pega unit tests that you need to validate the functionality for your application. When you add or edit a pipeline, you can add the Run Pega unit test task on your candidate systems and specify a Pega unit test suite ID that contains the Pega unit tests that you want to run. You can also specify whether you want to run Pega unit tests for another application by providing an access group.